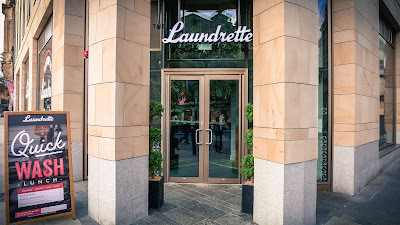 Walking past Newcastle Central Station towards Grey Street and clocking the billboard for The Laundrette, I couldn’t help but think that the barrel of restaurant themes was showing distinct signs of having been scraped too far. Why name a restaurant after a service that nobody needs anymore and which is scarcely glamorous? And what kind of specialism is their tagline “Cocktails and Carbs”? This Newcastle opening is the group’s third, the other two being in the Manchester area. The original, in the pleasant suburb of Chorlton, is housed in what used to be an actual laundrette, so fair enough on that score. But Cocktails and Carbs? Pff. 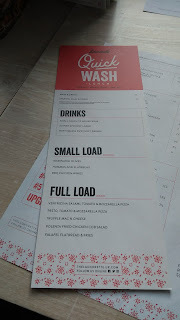 If the alliterated naming of a drink type and nutrient group is reason enough to open a restaurant chain then we’d better brace ourselves for “Pilsner and Proteins”, “Lilt and Lipids” and “Vodka and Vitamins”. All coming to a mixed-use development near you soon. As it happens, the theme has more bark than bite, as the menu turned out to be fairly standard summat-for-everyone fare including pizzas, burgers, salads, steaks and quite a few dishes with few or no carbs at all. The space is long and narrow, an open kitchen and bar taking up most of its length, while seating is either at banquettes or smaller tables. 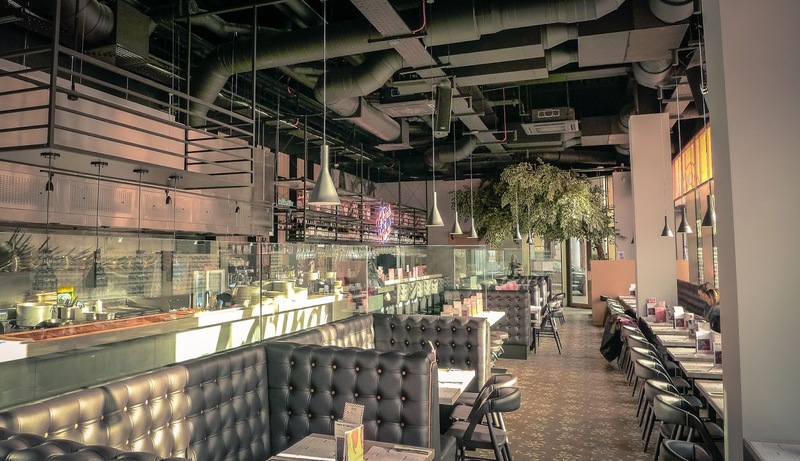 The style is a well-worn sort of modern industriana, with patterned polished concrete floors and more exposed air ducts than you can shake an extraction engineer at. I have no idea what the sore thumb of a big fake tree is doing in the corner by the entrance. Perhaps it was an unwanted gift. 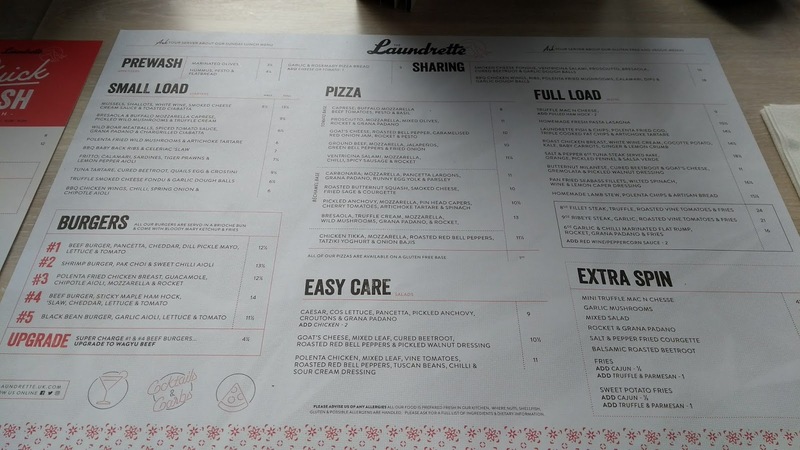 It being lunchtime, and with Mrs Diner and I being in “stuff to do” mode, we tried to tip-toe our way through some of The Laundrette’s lighter food and drink offerings. There was a cheaper “Quick Wash”, but we dug into the Extra Spin. Any time is a good time for a Bloody Mary, especially if it is well made. This was not. Intrigued by the notion of a drink involving bacon and HP Sauce (for what is a Bloody Mary if not a sustaining and refreshing breakfast?) I ordered a “Filthy Swine”. 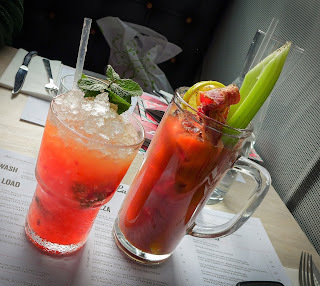 I received a preposterous, stein-sized glass that was nowhere near boozy or spicy enough (I’d asked for 7 on the spice-o-meter; this was scarcely a 2) and was garnished with a cold, wrinkled up slice of bacon. Avoid. Mrs Diner’s “Yummy Mummy” mocktail was much better on account of it being refreshing, possible to finish, and completely lacking in cold pork add-ons. The food oscillated between decent and duff, Mrs Diner managing to order all the better ones, comme d’habitude. 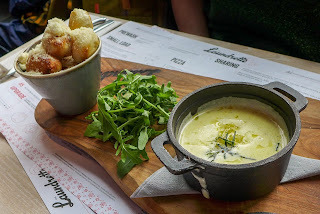 Her truffled smoked cheese fondu (their spelling) with garlic dough balls was an upgrade on the nacho cheese stuff that the criminally insane order at the cinema. The dough balls were light and nicely parmesaned, while the pot of molten cheese was improved by the addition of rosemary. 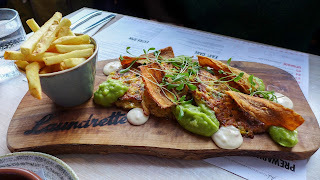 What a mound of undressed rocket was doing on the wooden board (natch) is anyone’s guess. Her main, a daily special of sweetcorn fritters, was pretty decent too. There was a nice waft of tingly spice about them. Plantain chips added some crunch and a side of fries were rustly and good. A scattering of micro herbs added some welcome greenery, although blobs of poor guacamole did not. 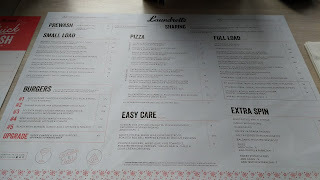 The menu reflects the restaurant theme. Starters are “Small Load”, healthy stuff is “Easy Care”, sides are “Extra Spin” and so on. My starter and main courses belonged in a section I’ve just made up called “Totally Fleeced”, as neither offered anything approaching good value. 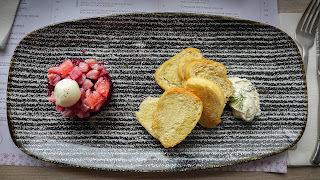 Tuna tartare turned out to be a small mound of cured (inexpensive) beetroot with just a scattering of (expensive) raw tuna on top. In any case, the dominant flavour was the bitterness of grapefruit pith, as nuggets of badly segmented citrus were unwelcome intruders amongst the fish. The whole thing lacked seasoning. £9.50. At seventeen quid with fries, I reckon their wagyu burger may be the most expensive I’ve ordered in this region. 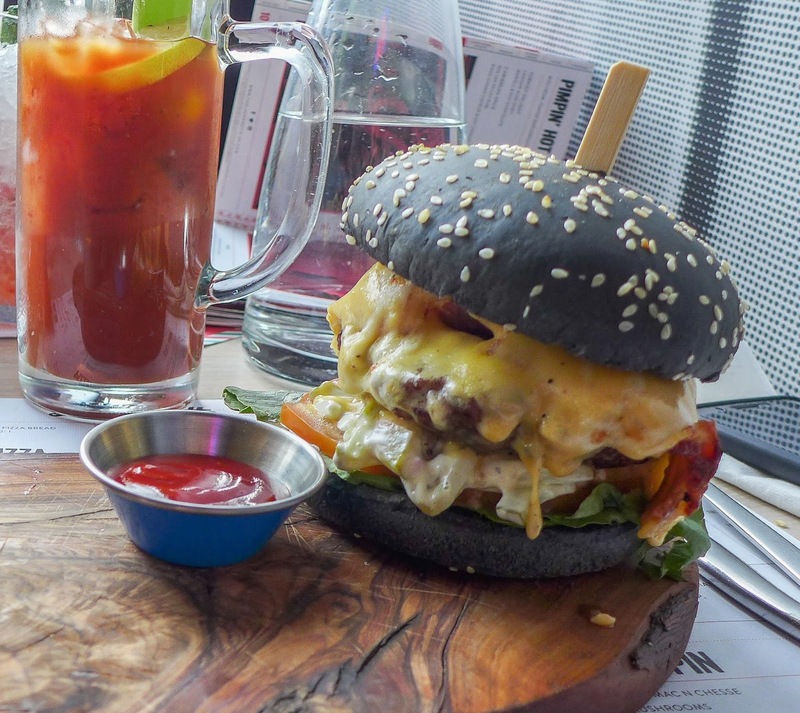 It came in a striking black bun (charcoal, apparently), but was just way too sloppy to be practical, with cheesy wiz and some sort of mayo. The pattie itself had ok-ish flavour, but was tight and mealy, which perhaps explains the overdose of sauce lubrication. Service was super-friendly but amateurish. Mrs Diner asked for ketchup twice. The first time resulted in mayo being fetched, the second resulted in nothing, despite us being one of only two tables in the place. I asked where the wagyu on my burger came from. I was told it was Japanese. Really, I asked? Yes, really. Japanese wagyu steak costs at least £300 a kilo. This would make my burger the bargain of the century. Turns out the meat is actually from Yorkshire. With so little custom, they might also want to check their toilets a bit more often. Mrs Diner came back from the ladies having happened upon a quite terrifying sight (someone had had too many carbs, or more likely cocktails), which quite put her off the rest of her sweetcorn fritters. We finished with a slice of raspberry cheesecake which, for a non-baked variety, was really rather nice. 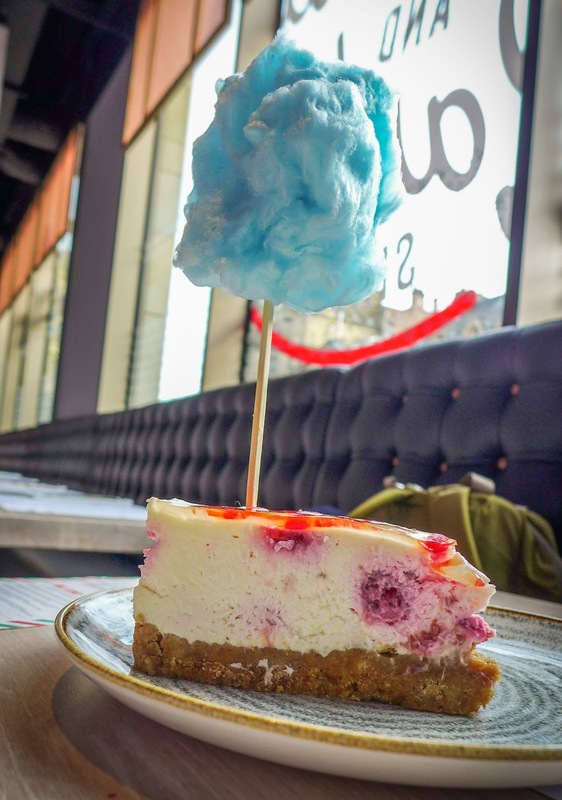 A skewer poking out the top of it held a blue cumulus of candy floss in place, because: Instagram. And that, in case it’s not already clear, is the point. This venue (fake tree! ), drink (bacon and waffles! In cocktails!) and food (black bun! lol!) are all designed to garner free publicity for the place via social media. Don’t take my word for it. 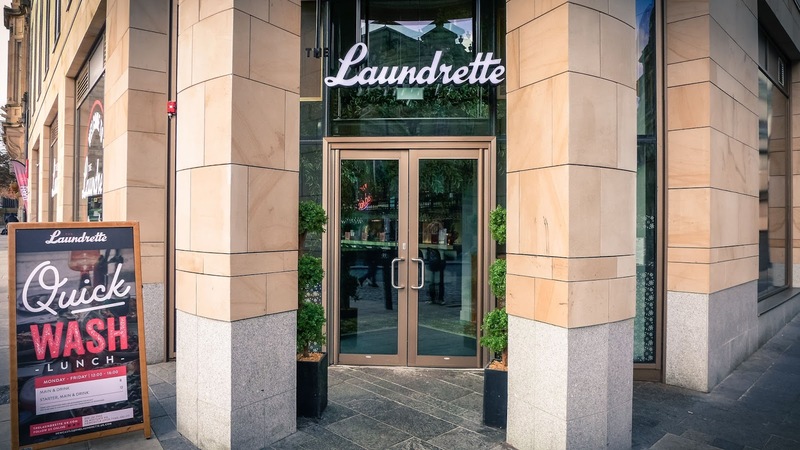 Patrick Hall of the Laundrette Group, speaking to the Newcastle Chronicle, said: “The brief we give to our development staff is: ‘make them Instagrammable’. We put candy floss on one of our cocktails maybe about three years ago. People were coming into the site and saying “Can I have the candy floss one?” They almost didn’t really care what it tasted like!’. So, if you’re someone who doesn’t really care what your food or drink tastes like, but get itchy if your Instagram feed isn’t bang up-to-date with the latest shiny thing, there’s a cracking new venue in town targeted at your demographic like an over-priced cruise missile (our bill was £71.50). To be clear, this wasn’t the worst meal I’ve eaten lately and the staff were really nice. But whoever it was for, it sure wasn’t for me. I am almost inclined to comment “style over substance” but it doesn’t seem to have much of the former either. Still, I suspect it will attract the gullible in search of a “fun” night out.